Free book promotion on Amazon 4/10/2019 - 4/14/2019! 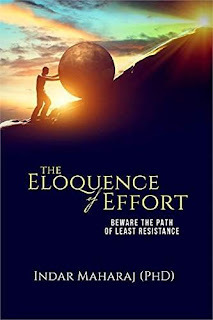 The Eloquence of Effort discusses the multiple rewards of hard-work. A boring subject, you snarl. But do read on and you may be pleasantly surprised. Life´s problems are spontaneous: unpleasant things just happen. On the other hand, the solutions to problems demand energy and effort. Left unattended, difficulties always worsen and finally degenerate into insoluble chaos. Have you ever wondered why things always break up, breakdown, degenerate, depreciate or simply fall apart? And why do we have to grow old? Why not the other way around? Have you ever considered what would happen if you abandoned two cars, an old and a new, and revisited them 50-years later? That´s simple, you say. The new one would deteriorate and the old will probably disintegrate into dust. That´s just the way things are, you exclaim. But why not the reverse? Just as the new one aged into a rusted rattle-trap, why didn´t the old one return to a spanking new drivable car? Undoubtedly, the question is a legitimate one. The idea stirs the imagination and compels the realization that effort is never wasted. Moreover, corruption in all its fiendish forms is indolence disguised as diligence. Analysis of biographical data sustains the claim that hard work prolongs life; indolence truncates it. These findings and answers to the question posed above are due to the forces governed by the Second Law of Thermodynamics, sometimes referred to as the Law of Entropy. According to this Universal Law, the purpose of life is to apply our energy to combat the tide of entropy that threaten to submerge the orderliness of our daily lives. Failure to do so results in our property, investments and our lives falling apart.